Percy Mackaye, whose amusing burlesque “Anti-Matrimony,” is on view in Baltimore this week, is one of the young dramatists in whom those who have faith in the future of the American drama place their chief hopes. The son of Steele Mackaye, a hack playwright of the old school, he has devoted most of his time, since his college days, to the composition of poetic dramas, and though they have failed of success on the stage, their many merits have given their author a high reputation. 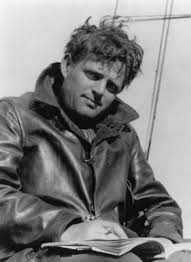 His best plays, “Sappho and Phaon” and “Jeanne d’Arc,” are quite the best poetic plays ever written by an American, and even across the ocean he has few living rivals to fear. Like Rostand and the Elizabethans, but unlike the majority of latter-day dramatic poets, Mackaye has a sense of humor as well as a hand for lusciousliness. His principal comic drama, “The Canterbury Pilgrims,” is full of the comic spirit, and in it the Wife of Bath, the Prioress and a score more of Chaucer’s characters live again. The play is comparatively unknown to theatergoers today simply because its principal role, that of the Wife of Bath, is beyond the talents of our leading actresses. Ada Rehan could play it and Ellen Terry would make it immortal, but both Miss Rehan and Miss Terry have long since left the boards. Therefore, the play is performed only occasionally and with small effect, and most of us have never had a chance to see it. As a frank romanticist it is but natural that Mr. Mackaye should find the solemn social studies of Ibsen but little to his liking, and as play-maker of experience and skill it is but natural that he should think to embalm his dislike in a burlesque. The result is “Anti-Matrimony,” one of the most amusing Ibsen parodies ever written—and the list of good ones, let it be remembered, is very long. The chief objection to the play, of course, lies in the fact that comparatively few playgoers know enough about the Ibsen plays to understand its foolery. It presupposes an intimate acquaintance, not only with “A Doll’s House” and “Hedda Gabler,” which are familiar to most of us, but also with “The Mast Builder,” “The Lady from the Sea,” “Rosmersholm,” “The Wild Duck” and “Ghosts.” Going further, it also delivers sly wallops at Sudermann’s “Heimat” (Magda) and “Johannesfeuer,” Hauptmann’s “The Sunken Bell” and Maeterlinck’s “Pelleas et Melisande”—not one of which has been played in America with sufficient frequency to make even its general outlines known. Like most other persons who scorn Ibsen, Mr. Mackaye reads into the Norwegian’s dramas ideas and arguments which are not there in fact. The hero of “Anti-Matrimony,” for example, is made to preach free love, and this doctrine is supposed to be the natural product of his Ibsenic enthusiasm. As a matter of fact, Ibsen was no advocate of free love, and not one of his plays even goes so far as to set it forth as a creditable scheme. Neither is Sudermann a foe of the wedding march. Neither is Hauptmann. Neither, for that matter, was Nietzsche—that most pathetic of all victims of misunderstanding, obscurantism and condemnation without trial. But we may well forgive Mr. Mackaye his error. It is too common to be denounced. Ask the average playgoer what idea lies at the bottom of “A Doll’s House” and nine times out of ten he will answer that the play is a tract against the institution of marriage. He is wrong, of course—but let him enjoy himself! Ibsen suffers no harm from honest burlesque. He was undoubtedly the greatest dramatist of modern times, and not since the day of the Greeks has any single playmaker exerted so powerful an influence upon the whole playmaking craft. Every serious drama that reaches the stage today, whether in France, Germany, England or America, shows some trace, however faint, of his ideas. He rescued the modern stage from sentimentality and banality; he brought the drama down to earth; he turned the attention of dramatists to the truly fundamental problems of human life. But he was merely a man, and not a god, and so he fell short of perfection. The personal idiosyncracies which crept into his plays, the ideas which obsessed him unduly, the little prejudices and foibles of the man, the deadly seriousness which often overcame his sense of humor—these things are legitimate targets for ridicule, and when that ridicule is laid on as deftly and as lightly as Mr. Mackaye lays it on the result is exquisite amusement. All great pundits and mullahs deserve to be put in cap and bells now and then, and the sacrilege does them good. Here in America, despite out alleged taste for humor, we are too childishly reverent to indulge in that sort of sport. We hold to the abominable doctrine that whatever is held sacred by one man should be viewed with hushed awe by all other men. Nothing could be more untrue. As a matter of fact, the reductio ad absurdum is the most searching and efficient of all forms of criticism. An idea that is worthwhile always survives ridicule. The idea at the bottom of Christianity survived it. So did Copernicus’ theory of terrestrial motion. So did the doctrine of natural selection. But an idea that is fundamentally wrong quickly yields to horse laughs. Ridicule, in brief, is the best of all weapons to employ against bumptious authority, vapid theorizing, doctrinaire imbecility, tinsel sacredness. It is a pity that we Americans do not imitate the French and Germans and employ it more frequently. If we did, the air of this fair land of ours would be clearer, and there would be fewer self-constituted prophets coursing through the country, impressing the common people with their pomposity.